Safe & Secure Shopping. Gear & Advice You Can Trust. 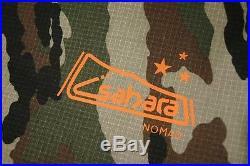 Sahara Nomad King Single Dome Canvas Swag & Bag – Camo. Add to Favourite Sellers. Best value and quality swag in it’s class and now comes in Camouflage colour! TheNomad is a deluxe style 3 hoop dome swag with unique dual topor front entry, 55mm mattress and uses top quality 14oz rotproofed Tear resistant ripstop cotton canvas which is a supple highly waterproof fabric with exceptional breathability. A well ventilated swagthat features super strong pre-angled 8.5mm aircraft strength aluminium poles- twice as strong as standard fibreglass poles or thinner alloy ones, extra lengthat 2150mm, 3/4 length zip-off top canvas flap with No. 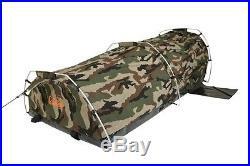 #10 heavy duty zips, heavy duty PVC base, 3/4 sandfly proof fly-mesh and mosquito net top, inside pockets, sewn in Nylon straps and tough duraflex buckles for rolling/carrying, raised pvc tub floor, front and side pvc floor mats, unique zippered pole pocket in base of swag and much more. The swag comes standard with an egg-crate style convoluted mattress with removable washable cover, which reduces pressure on the body which helps to prevent possible pressure sores. The cradle effect on your body gently relieves pressure and provides an even distribution of added support. The convoluted surface also provides increased airflow and in turn stays dry and cool. This Swag is easy to pitch, store and carry and comes with a tough matching camo canvas carry bag that features Nylon webbing handles and full length heavy duty zipper. For full features read feature list below. Waterproof 100% 14oz poly/cotton canvas which is rot proofed, UV resistant, breathable and mould resistant. High quality zippered mesh fly screen on top and front. Double stitched with binding all round for extra toughness. Zippered pole pocket in base for storage. 55mm egg-crate foam mattress with removable and washable cover. #10 heavy coil duty zips. 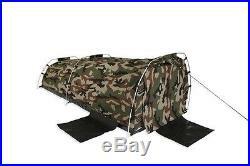 Extendable front awning with eyelets or roll down canvas window flap. 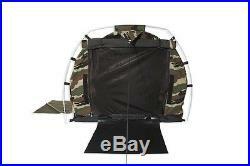 Zippered front mesh window or alternative entry for bad weather. Sewn in side and front pvc floor mats. Secure Zippered top flap for storm cover. Top flap zips down side both sides. Raised tub floor for waterproof and splash protection. Robust reinforced peg down points. Tough 8.5mm silver pre-angled alloy pole. 2 inside key, wallet or torch storage pockets. High quality luggage style duraflex quick release buckles and Nylon straps for quick set up, carrying and pack up. Durable high strength thread – double stitched and bound. Comes with pegs, guy lines and canvas peg bag. Comes with canvas carry bag with tough webbing handles and heavy duty zip. Base: 500gsm PVC raised tub floor. Weight: approx 9kg with bag. Capacity: 1 person king single. Packed size approx 900mm x 300mm. Size: Length: 2150mm x Width: 900mm x Height: 800mm. BEST BRANDS & PRICES. There are plenty of discount operators out there, but all you get from them is a cheap price and nothing else. If it’s just a price you’re after these guys might be for you, but if you’re after a service orientated company that won’t sell any other way then welcome to our store. Our cheap postal prices are live up to date prices with Australian post or courier. Our website is state of the art safe and secure, using a 128 bit SSL encryption protocol, the most secure online-shopping protocol. Unfortunately we DO NOT accept EFT direct deposit. If your item is a double swag or over 20kg parcel must be sent via courier and a daytime street address is required – NOT A PO BOX. Express and regular options are available for most items. All item prices include GST. All payments made payable direct to’Wild Earth. While all care is taken, any errors or omissions/variations in the item details are unintentional. Colours and images are for illustrative purposes and can vary so please specify when ordering if you require a specific colour otherwise an alternative colour may be sent depending on stock availability. WILD EARTH AUSTRALIA PTY LTD reserves the right to make changes to this site and these terms and conditions at any time. From time to time we may contact you about offers and new products. You can easily be removed by unsubscribing. For full terms and conditions please visit here. We are here to help you! The item “Sahara Nomad King Single Dome Canvas Swag & Bag Camo” is in sale since Wednesday, September 07, 2016. 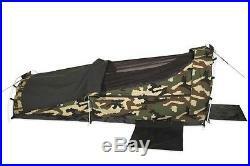 This item is in the category “Sporting Goods\Camping, Hiking\Tents & Canopies\Tents”. The seller is “wildearth-australia” and is located in gold coast. This item can be shipped to Australia, United States, United Kingdom, Canada, New Zealand.